Tuesday Treats featuring...Jelly Beans -n- Crafty Things!!! Hi there! 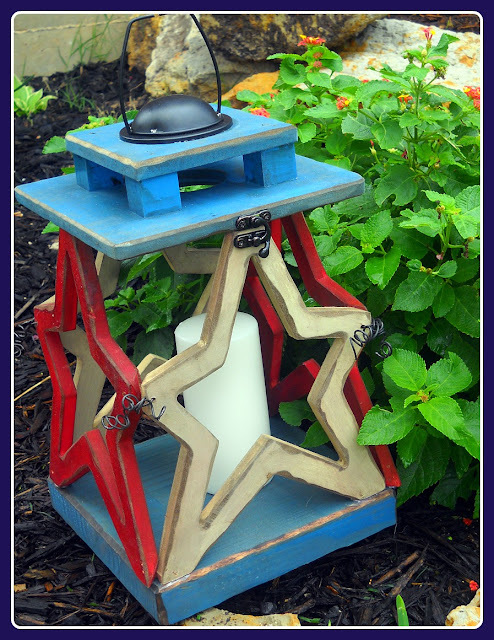 My name is Lindsay and I blog over at Jelly Beans -n- Crafty Things. I am a new mom to a beautiful 10 month old baby girl and a wife of 3 years. I am new to this part of the blogging process but I am loving it and I am very excited to be guest blogging here today! 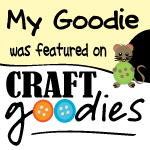 Craft Goodies is one of the first few blogs that got me addicted to craft blogging and I love to see what Wendy is going to post next! I don't know about you, but our mail always seems to pool somewhere in the kitchen. Usually the counter, or the kitchen table. And when company comes over, it gets shoved somewhere and usually thrown away at a later date....a much later date! Then you can't find the bill you were supposed to pay or the RSVP you were supposed to send in and .... Its a vicious cycle! But I am here to help you! Today I'm going to show you how I made my mail organizer and how you can make your own! Starting with the top pocket, place fabric RIGHT sides together, and stitch along one side with a 1/2" seam allowance. Don't forget to back stitch at the beginning and end! Now fold your material right sides facing out and press. This will give you a crisp edge. Stitch across the top with a 1/4" seam allowance. This will be the top of your pocket. Repeat with remaining 2 pockets. Now take your 3 1/2" x 2 1/2" piece and sew right sides together around the edge leaving a 1" opening for turning. Clip corners...be careful not to cut your stitching. Turn your pocket right side out and use a chopstick to push out the corners. Fold your opening inside and pin. Sew completely around the edge of your piece with 1/8" seam allowance. Now we're going to measure for the placing of our small pocket and also mark where our other pockets will be. Measure in from the left 9 1/4" and make a mark at both top and bottom. Using your ruler, make a faint line from top to bottom from each mark. Then measure 1" up and 1/2" from each side. This is where your small pocket will sit. Stitch in the ditch (on your previous stitch) on the left side, bottom, and right side of your small pocket to attach to the big pocket. Now we're going to attach our pockets. Take your front 15 1/2" x 15 1/2" piece and measure down 2" from each top corner. Lay your top pocket on these marks and pin down. Sew the bottom of the pocket down 1/4" up. Lay the top of the next pocket on the line you just stitched. Pin and stitch bottom. Repeat with last pocket. The tops of your pockets will not be attached at this point, but we will fix that later. Keep the top of your bottom pocket pinned. Going from top to bottom, stitch the lines we drew earlier. We made 3 pockets out of our big pocket on the bottom! Now take your backing fabric and lay face down on your pocket piece. So it will all be right sides together. Make sure your pockets are all flat! Its not a bad idea to press one more time before this step. Go pin crazy here. Pin all the way around your organizer making sure to pin each pocket edge down well. Stitch completely around the edge with a 1/4" seam allowance, leaving a 3-4" opening to turn. Clip corners and turn right side out. Push corners out with chopstick. Fold the edges of your opening in and press. Stitch 1/4" around the edge of your organizer. This helps give a more finished look as well as sew up your opening. There are 2 different tools you can use for your grommets. I like to use the tool that comes with the grommets for the pinching, but the other tool works too and is great for punching the hole. Decide where you would like your grommets to be. I placed mine 3/4" in from the top and the side. Make a small mark directly in the center of your grommet. Using your punch (or your scissors) cut a small hole around your mark. The hole should be about the diameter of a pencil. You may need to use your scissors to finish off the hole completely. Push the grommet through the hole you just made. It will be tight. Place the grommet back on the back side of your organizer with the sharp teeth pointing down. Place your tool on your grommet. My husband pounded these in for me. Make sure you don't pound them in too much or it will warp the grommet. Flip it over and there you have it! The tiny pocket is perfect size for an envelope of stamps! I am using the top pocket for bills to be paid, the next is for other mail that needs action, like a phone call. My address book is a little big but it fits in the left pocket and the other 2 pockets are perfect side for a notebook and some pens! Or whatever you would like to make them as! Last step is to hang up on the wall and Enjoy! I hope you enjoy making your own mail organizer! Come over and visit my blog any time! I'd love to have you! Thank you so much Wendy for letting me share! Fantastic Lindsay, thanks so much for sharing. Summer is my get organized season and this is such a great idea, not only for mail, but for upcoming homework/spelling lists/reading logs, etc for my girls next fall. (Did I really just say "homework", already? YUCK!) Go give Lindsay a visit and welcome her to bloggy wonderland! Happy Crafting. I just wanted to pop in for a minute and express my thanks and gratitude to so many people I will never know personally on this special day. As a child Memorial Day was always spent with my mom's family traveling from tiny cemetery to tiny cemetery decorating headstones of long gone family members.I can honestly say I didn't love all the driving, but I do remember how wonderful it was to hear my grandmother tell stories and share memories of those wonderful people. The holiday has a different feel to it as an adult. My family is to far from those small town cemeteries to be able to share that part with my girls, but we do talk about family. Those still here and those we've lost.But now, we also talk about the men and women that have served our country and continue to provide us with "The Land of the Free".One of our very dear friends is enlisted in the Air Force, we are so blessed that he is safe and still with us.There are so many that are not. To those of you that have lost family members serving abroad-thank you for your sacrifice to keep my family safe and away from harms door. Your loved ones are in my thoughts and prayers continually. I have started something with my girls that maybe each of you can also share with your little ones that don't really grasp the magnitude of what others are sacrificing for them-every time we see a flag waving this weekend we count it. At the end of the day we talk about how many flags we saw and how each flag represents someone that gave their life to keep us safe. And we add those people's families to our prayers as friends that we hope will know how much we appreciate what they gave. 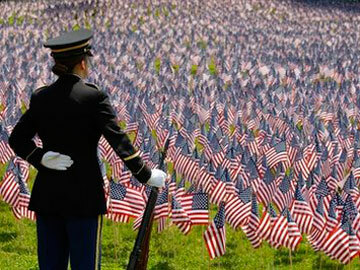 God Bless those of you with Heros in your own families and THANK YOU so much from mine. I was watching the weather reports for this upcoming week and it's supposed to beHOT!! !I found these two frozen pudding pop ideas over the weekend and think they will be on the menu more than once this week.They are cute, look super tasty, and the kidlets can make them (almost) on their own.That makes them PERFECT to me!enjoy... Rainbow Pops fromRandom Thoughts of a SuperMom! andRoot beer Float Pops from Smile Monsters Don't they look just heavenly? I'm thinking there has to be a way to turn that root beer into orange cream-OH! it could be a fun filled pudding pop week here at the Gardiner house. And cause I know you're making them, I'm giving the chance to link them!Keep those summer meal ideas coming cause well, it's way to hot to cook!!! Happy Crafting All! T.G.I.F.-Thank GOODIES it's Friday #18!!! ...same idea as always, take the host project but do it YOUR way, or (here's the new part) use the stars as your inspiration and create your own project! Also new to WYLTC is the availability of kits to re-create the host project. There will be a limited number of kits available starting Monday. You will find the link here on CG and on the WYLTC main page. If you've wanted to join us but haven't had the means to do so, now you will! Alright! Enough talk, let's play! Keeping it short and sweet- link up to 4 posts, anything goes so make it great! Share the love by visiting others and telling them how great they are-think of it as a virtual HUG, you know you want one.By linking you allow me to feature your greatness at a later date giving all credit to you with a link back to your post of course. Have fun, can't wait to see what you've been working on and...Happy Crafting!!! Labels: featuring you, T.G.I.F. Linky Party, Wood You Like to Craft? 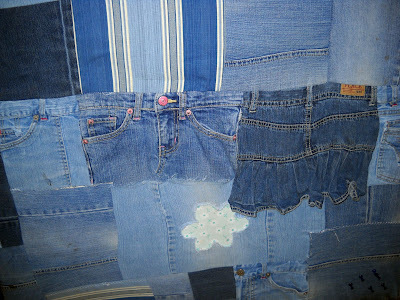 So it's the end of the school year and I have found myself surrounded in well worn-no knees remaining and too small jeans.I salvaged what I could into shorts for the summer-(I have a great hemming trick I need to share with you!) but still had a few odds and ends left over. I'm having issues with tossing things out that I know I could use for something so I had to find a use for these little critters. 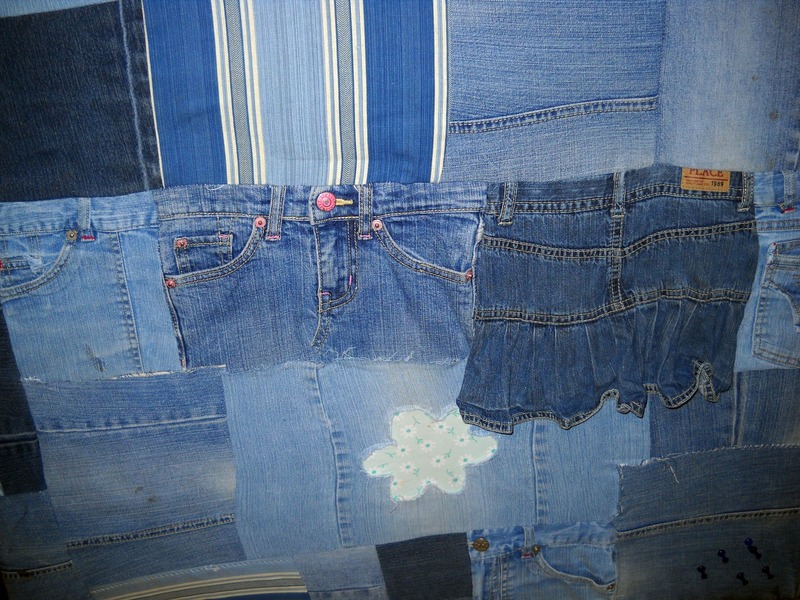 I found it!I cut and sewed the remaining pieces together to form a patchwork wonderland of denim. I made a point to keep the pockets so they could be used to tuck notes or pictures into. To make the board (I'm going backwards, sorry and I have no pictures. Wasn't thinking there!) I covered a 3 ft x 3 ft piece of plywood with foam-core poster board. I used two pieces and had to cut them a it to fit the board completely. I glued the foam core into place with wood glue. Then I covered the dry foam-covered board with the fabric piece, attaching it to the back of the board with the staple gun and duct tape! From there it could have been done, it looked great. But I have a tall skinny wall to cover and wanted it to take up a bit more space so I built a frame out of 1x3's and added a 6 inch wide shelf across the bottom.It looks awesome in my daughter's room and she is thrilled to have a "cool" bulletin board. A few after thoughts here-you could easily do this with a store bought bulletin board. Either pop off the frame, cover the board, and then re-frame it. Or just cover the whole thing using your good friend the duct tape to keep it all in place. The pockets are super fun! They are great to hold a pen, extra cash, or a love note from mom. Good choice to use them. All the buttons and zippers were a pain to sew around but they add so much to the overall look of the board I'm glad I kept them.I also made a point to keep some of the patches on the knees-these were my daughters favorite pants, and the patches helped her to recognize them and know in a way she still had them! (She's a total sap-just like her mom!) 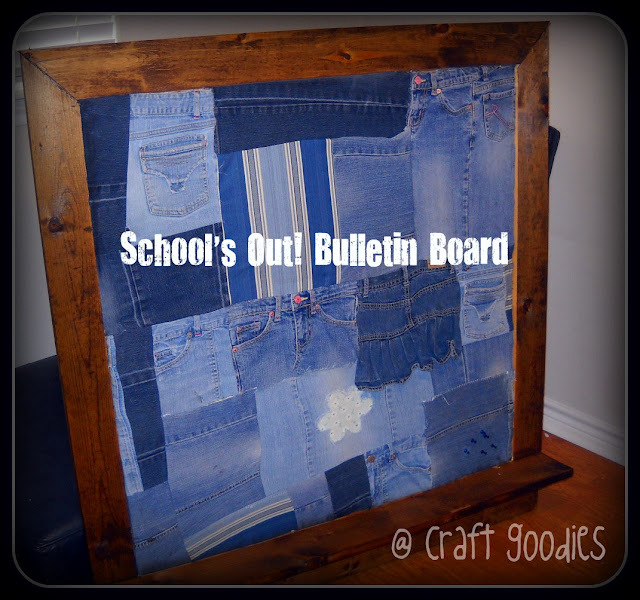 Overall-a fun project to use up the no longer wearable jeans and a super cute functioning bulletin board. Guest Posting at The CSI Project! 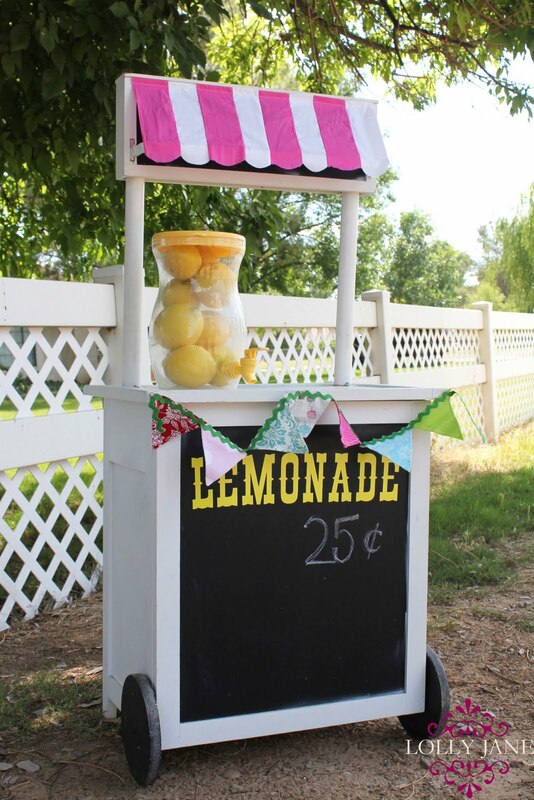 Fun for You & Summer Freebies for your Kids!!! T.G.I.F.-Thank GOODIES it's Friday #17!!! T.G.I.F.-Thank GOODIES it's Friday #16!!! Guest Posting at The Crafty Sisters! Tuesday Treats featuring...what I'm up to! Monday Munchies...South of the Border!